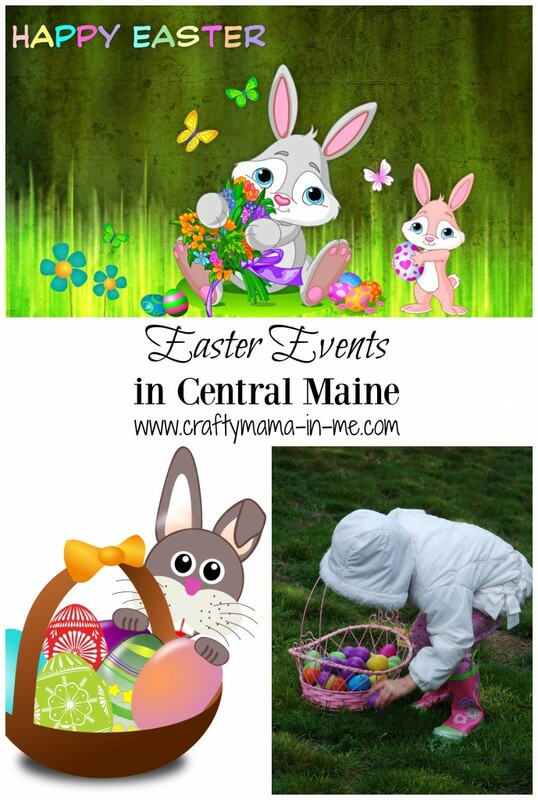 Easter Events in Central Maine - Crafty Mama in ME! Do you love to celebrate the Easter season with your kids by attending an Easter Egg Hunt or Breakfast? Read on for some ideas of places to have family fun at Easter Events in Central Maine. Old Town/Orono YMCA – 8am-11am. More information here. Leroy Smith School, Winterport – 9am-1oam. More information and signup here. Grace United Methodist Church – 10am-12pm. More information here. Kennebec Community Church – 10am-11am. More information here. Aubuchon Hardware, 484 Wilson Street, Brewer – 10am-2pm. Bangor Baptist Church – 11am-1pm. Frankfort Baseball Field – 11am-1pm. JCPenney – 9am. Head to the Children’s department for a fun egg hunt! Glenburn Parks and Recreation Department – 10am-11am. More information here. Head of Falls – 10am-10:15am. More information here. 90 Schoolhouse Road, Orland – 10am-11am. More information here. North Street Playground, Waterville – 11am – 1pm. More information here. Bangor Area Recovery Network – BARN – 11am-2pm. More information here. Wiscasset, Waterville, & Farmington Railway Museum – 97 Cross Road, Alna, ME. 12pm to 3 p.m.
Join the WW&F Railway Museum as they celebrate Easter with Steam train rides 12 noon to 3 p.m., and Easter egg hunts at Alna Center! Train tickets are only $5.00 per person, and free under age 3. More information here. East Orrington Congregational Church, 1pm-2:3opm. More information here. First Baptist Church of Hallowell, 9:00am and 10:30am. More information here. I will be updating this as I find more events – if you know of any please comment and let me know.